But why am I describing her amazing works to you? You can see for yourself right here! Hello Uru fans!!! I’m Jennie from The Messy Baker, and I’m here to fill in while Uru is knee deep in school books and test taking. Good luck, Uru! expertly appear for the world to swoon over. When I grow up, I wanna be just like Uru! 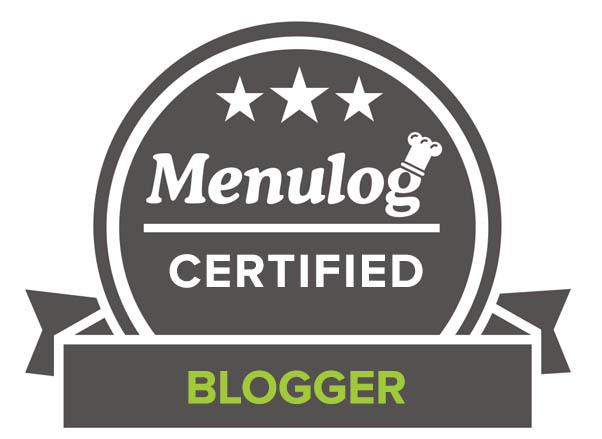 I’ve been reading Uru’s blog since I started my own blog back in December 2011. I adore her personality, her creative storytelling, and, of course, her delicious recipes. Uru recently celebrated a 1 year blogiversary, so I decided to celebrate with…You guessed it, a chocolatey dessert :D.
Peanut butter banana s’mores bars to be exact. They’re gooey. They’re fudgy. They’re made with a brown butter graham cracker crust. They’re DELICIOUS! My brother took the pan of bars home the other day, but they never actually made it home. Not sure where he took them, but the rest of my family never got so much as a sniff of those bars. My heart breaks for them, because these bars are amazing. Let’s talk about brown butter for a second. Hands down, it’s the best invention ever! I only discovered it a few weeks ago, and I’m already head-over-heels in love with the stuff. It’s warm nutty flavor gets me every time. Even if I wanted to break up with it, I couldn’t, because I just can’t stay away from that buttery flavour . As if the brown butter crust wasn’t enough, I topped it with a fudgy mixture of melted chocolate, mashed bananas, and creamy peanut butter. All the things that belong together…in holy matrimony, forever and ever. Wait, it gets better. I sprinkled the chocolate layer with marshmallows and toasted almonds. Here’s what a bite of this is like: Brown butter graham cracker crust swirls together with the fudgy chocolate peanut butter banana layer, pairing so perfectly together with the nuttiness of the crust and the pudding-like layer of the chocolate, then you get the crunch from the toasted almonds and the sweet burst from the soft clouds of fluffy marshmallows. You’re immediately transported to dessert heaven, watching yourself enjoy every bit of that chocolatey dessert from the land of the extraordinary, wishing it would never end. Don’t worry, my friend, there’s an entire 9-by-13-inch pan just waiting to be devoured. Preheat oven to 350 degrees (180 degrees C). Butter a 9-by-13 baking dish. Add butter to a small saucepan over medium heat and simmer until it turns slightly amber in colour and begins to smell nutty, about 5-7 minutes. Place graham crackers, brown sugar, and salt into the bowl of a food processor. Pulse to a fine crumb. Slowly pour in the brown butter while slowly pulsing until the crust represents wet sand. Pour the mixture into the prepared baking dish and press evenly onto the bottom of the dish. Add both chocolates to a large bowl. Set aside. In a medium-sized bowl, add both bananas and mash with a fork or a potato masher until smooth. Stir in peanut butter and agave. In a small saucepan, bring cream and half + half to a boil. Pour mixture over chocolate and let sit for 1 minute. Stir until chocolate is completely melted. Fold in the peanut butter banana mixture until well incorporated. Fold in the marshmallows. Pour batter over graham cracker crust and sprinkle with toasted almonds. Cover and refrigerate until the chocolate topping is completely set, about 4 hours. Cut into bars and serve chilled. Store in refrigerator for up to 7 days. If you all want more recipes like this and wish to indulge in serious drooling (a towel is recommended equipment for this activity) come check out Jennie’s delicious eats over at The Messy Baker! These look fabulous Uru!! I love that they have agave in them!! Yum! These look so gooey and delicious. Oh my that looks delicious. For sure I will try to make these. Thanks for a great blog and awsome recepies. 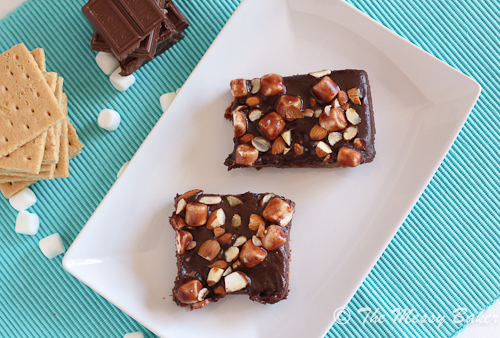 I love Jennie’s blog, too…and these bars looks just as fabulous as everything else she shares! YUM! What a creative recipe & the photos are great too! Sounds healthy to me with its bananas, agave and almonds. Yum, yum! My God. Looks so so so good! These look delicious! Keep up with your studies Uru!! These bars look so addicting! Sounds like all the good stuff is packed in the bars. Loving the gooey look! YUM!!! If you gave these to me I might make them disappear too! S’mores bars? What s’mores bars? Heehee they’re insanely good looking! o-m-g this looks devilishly divine! Oh my, it’s looking so good! Jennie – these look too good to be true 🙂 YUM! Thank you for sharing your recipe! Thank you Jennie and Uru! De-li-ci-ous! That’s what I can say! What a decadent bar, of course I wouldn’t expect anything less from you CCU. These look absolutely divine, Jennie. I’m totally digging the PB and banana in this recipe too. Uru – I hope your exams are going swimmingly. As swimmingly as exams can go anyway. I remember them… ugh! The pictures are absolutely fabulous, making the cookies alive and kicking. 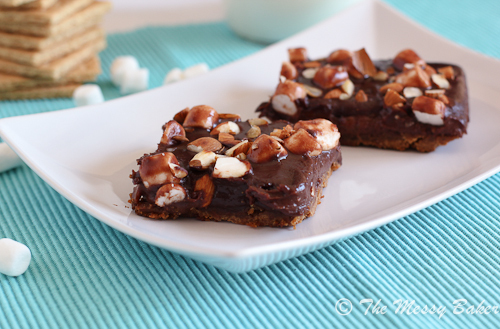 These banana and peanut butter smores look decadent! All the best for your exams, CCU! Yum, these look absolutely gorgeous. Being from the UK I’ve never actually had smores but I’m going to have to fix that! 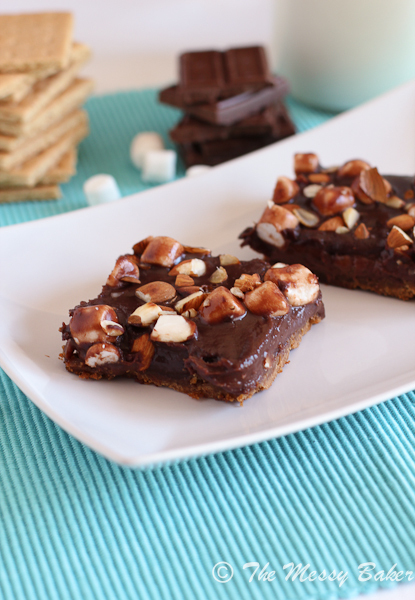 these are some killer bars, and i need to make them asap! MMM gooey, chocolately and delicious! These are dangerous! I might not be able to stop eating them. So good! Jennie, when I recover from cookie baking, I’m going to make these bars as I know that the ponytails and my husband would just love them! Good luck with your exam prep CCU! Hi, this look very tempting. Look really good and great combination. Oh good God – I just had an out of body experience simply staring at these amazing bars. I can only imagine what would happen if I actually ate one (my head would probably explode). I love Jennie and her blog so this is the perfect collaboration with Uru! This makes me think of a blistering fire and fuzzy blankets…love, love love! Wow, these bars look great…chocolate, peanut butter and banana just cannot go wrong. I have never tried s’mores but these look so amazing I think I will have to HO out and buy the ingredient straight away. Chocolate, one of my most favorite things, and these bars were made for me. Thanks. Two of my favorite ladies in the same place??? Gorgeous bars and fabulous pairing! OMG – is it wrong to covet these gor breakfast? Sinfully good. Mmmmmm. I had an aunt who’d lived in the USA and spoke with reverence about s’mores – but never actually made them so until now I wasn’t quite sure what exactly they were so thanks Messy Baker for an introduction to the king of S’mores – what a sweet guest post! smores most definitely remind me of my american friends from the international school in mexico! I had never heard of them until then, and LOVED them. Can we say that these are the ferraris of smores?! Totally indulgent, probably best eaten on a day when I’ve got a long run planned! 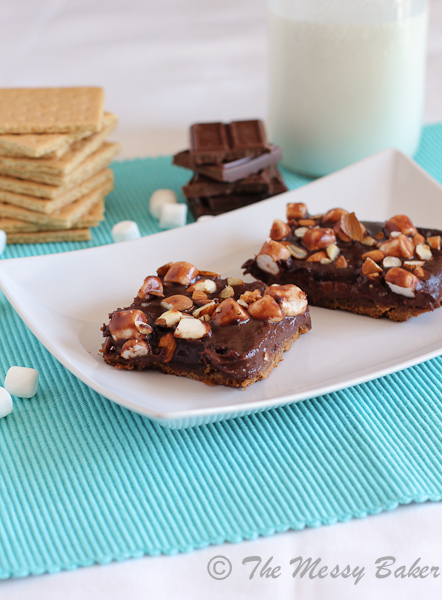 Thanks, Jennie, for sharing this gorgeous bar recipe. They are irresistible! How great to find Jennie here. You too girls could rule the yummy chocolate treats world! And brown butter to start with; you have my fat, baking heart with this recipe! That’s certainly a lot of goodness in a single bar! Too much temptation, and just before Christmas.. If anything is left from 9×13″ pan then send some for me. wow, i love this. love the combo of peanut butter and banana.. looks so good. Stay focused Uru! You have great guests helping you! I love that we are getting into smores in Australia. They are so bad for us but they look great! I love every ingredients in these – I must make them soon!! Wow, at first glance one doesn’t realize just how much goes into the bar/square. Love the banana in there! Hope the exams are going well, Uru. And I agree with your description of these yummy bars! What a fantastic recipe! I discovered brown butter earlier this year, and I love it too. These are gorgeous and look SO good! Not sure these should be legal ;-)! oh wowowow! these bars look way too good! really looks delicious! Will try this one tomorrow! Thanks! Peanut butter and bananas? In a s’mores bar? Sign me up. Good recipe, good post. Thanks so much. Jenny’s recipe is heavenly. Great guest post and I must check out her blog. I too love and extol the utter deliciousness of browned butter. Must try these! AHHHHH OHMYWORD! This is why I love Jennie. These bars are just…whoa. Hi Uru! Sorry I’ve been MIA for awhile, but I’m knee deep in a research paper. Ugh, school, am I right? Thank you for your kind words about me and my website; you are the sweetest gal. I was honored that you asked me to do a guest post, and I had so much fun preparing it. Good luck on your exams! You are more than welcome and thank you SO SO much for the fantastic guestpost, it was most enjoyed! OH. MY. WORD these look good! PB and banana is one of my fav. combos… paired with s’mores is just genius! Oh my! Love the gooey bars. These look wonderful. Peanut butter, chocolate, and graham crackers = triple yummy!!! Just love how the calories are crawling over your posts – my dentist would love you *smile … Uru, haven’t you received a white envelop yet ???? Can’t believe that you haven’t got your envelop – it’s you and another receiver that haven’t got it yet, both of you living in Australia. It does take longer here to send out and receive my friend fingers crossed! Same has arrived a week ago in Australia. Don’t have clue why you haven’t got yours. Uru, thanks … a lot – Happy Holidays to you too. We made it into our Lucia song in 1924.